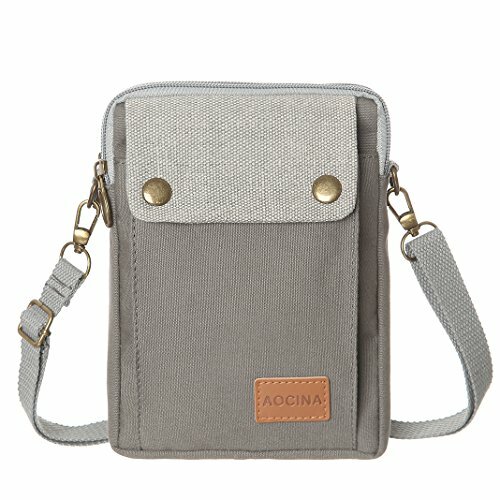 We designed the AOCINA bag for fashion,confident,modern women.The cell phone crossbody purse and small crossbody bags we offered are great for work/travels and other special purposes. Our goal is to provide our customers the great quality products and the best warranties. If you have any question, please feel free to let us know. We are always here service for you. DIMENSION AND MATERIAL: Cell phone bag made with canvas and cotton,size:5.5*7.5*1.2 inch,weight:0.22 LB. SUITABLE PHONE MODEL:Cell phone crossbody purse fashion in design and style, giving full protection for your device from scratch, drops and damage .Such as iPhone X,iphone 8/8 plus, iPhone 6/6 Plus; iPhone SE; Samsung Galaxy S9/S8/S7/S6/S5; Samsung Galaxy Note 8/Note 6/Note 5 and other cell phones with screen size under 6.9 inch. SMALL BUT ROOMY :Small crossbody purse has two main pockets,perfect for holding your mobile phones(max size is less than 5.5 inch)credit cards,keys, lipsticks,headphones,tickets, cash and classify your personal small stuffs. BIRTHDAY GIFTS:small purses a wonderful choice for on-the-go trip,shopping,dating when you do not want to taking too much stuffs out. It is great idea as a small birthday or Festival gifts/present for the one you love. MULTI-CROSS WAY:Cellphone purse with adjustable shoulder strap design, you can wear this bag cross-body or single shoulder. If you have any questions about this product by AOCINA, contact us by completing and submitting the form below. If you are looking for a specif part number, please include it with your message.